Billed as, "a different afternoon," the matinee production of Jean-Paul Sartre's "No Exit" is exactly that. Appearing through June 24 at the King King Club, the one-act existential drama about the afterlife of three people in hell is suited to the dark recesses of the night spot at 6th and La Brea. Perhaps that's because the King King, which nightly features an assortment of live roots-oriented rhythm and blues and Afro-Cuban-Latin jazz and soul performances, is opening its doors for "No Exit" in the middle of the day. Sartre's contemporary classic, involving two women and a man together in a hideous room in hell, is starkly lit on a barren and ugly stage. Audience members are far removed from the usual cushion-seated theater experience, perched on bar stools. Like something out of the Twilight Zone, it's almost as if you stumbled off the street into a tiny dark chasm or window to the lower world. Daylight eclipsed as soon as the King King's heavy and red lacquered door is shut. Murky lighting and flat black painted walls are relived only by the Oriental trim that snakes its way around the room and a few pieces of overstuffed furniture - appropriately upholstered bright red. You don't normally think of the King King as a theatrical space," says Wyn Costello, the producer of "No Exit" and who portrays Inez in the four-character play. "But it's got really good karma, it's got a stage, and it's not pretentious like so many 'in' clubs these days. 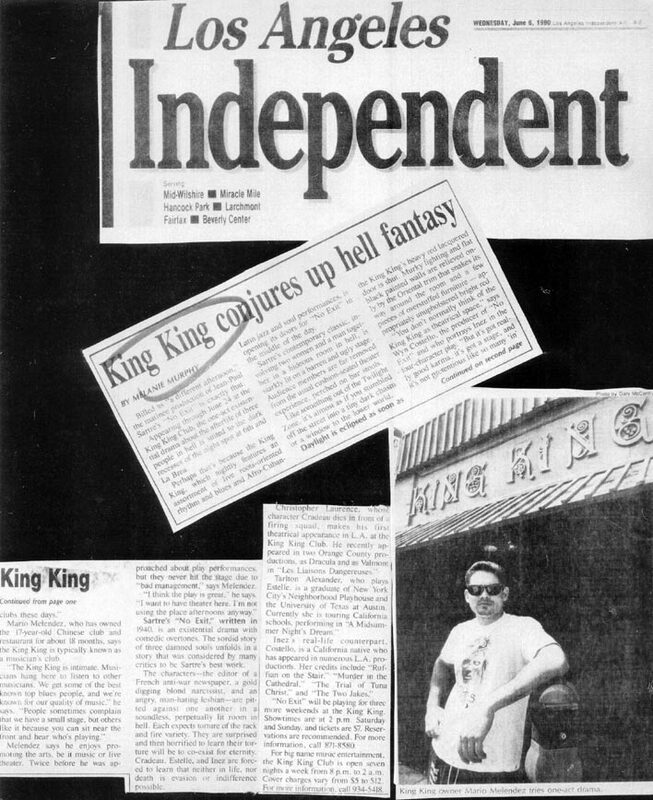 Mario Melendez, who has owned the 17-year-old Chinese club and restaurant for about 18 months, says the King King is typically known as a musicians club. "The King King is intimate. Musicians hang here to listen to other musicians. We get some of the best known top blues people, and we're known for our quality music," he says. "People sometimes complain that we have a small stage, but others like it because you can sit near the front and hear who's playing." Melendez says he enjoys promoting the art, be it music or live theater. Twice before he was approached about play performances, but they never hit the stage due to "bad management," says Melendez. "I think the play is great," he says. "I want to have a theater here. I'm not using the place in afternoons anyway."